Extra Life’s gamers showed up this year! 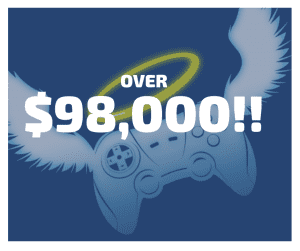 Over the course of 2018, Extra Life Atlanta raised over $98,000 for Children’s Healthcare of Atlanta and continued to ensure local kids continue to receive the best specialized care. These fundraising efforts consisted of many 24+ hour streams throughout the year, Game Day in November, and donations from local companies, friends, and of course family members who supported Extra Life. 2019 is off to a great start! Hi-Rez Studios already hosted their own Game Day on January 10th through their platform, Hi-Rez where they work to give back to their community. Being their first year involved, they crushed their goal of $10,000 and raised over $28,000! Thank you Hi-Rez for your support of Extra Life and Children’s Miracle Network Hospitals! Be on the lookout for Extra Life booths set up at your local conventions this spring and unite together to support Extra Life Atlanta. 2018 was a great year for Extra Life, but we have a feeling 2019 is going to be the best one yet!